The box office is located on the first floor of Sarratt Student Center and serves as the primary ticket seller for campus events. In addition to on-campus sales, event tickets may be sold online through Ticketweb. Also available to the VU community, are discounted tickets for RTA bus/train service, and movie vouchers for Regal Theatres. Valid Vanderbilt ID is required. Payment types accepted: All major credit cards, and Commodore Cash. Please note: Beginning May 1st cash will no longer be accepted. Planning an event on campus? Thinking about ticketing, but just aren’t sure where to start? Curious about selling tickets off campus? 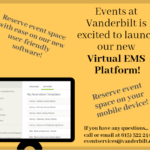 We are your one stop shop for campus event ticketing at Vanderbilt. Whether you’re a student organization planning a talent competition to raise funds for a charitable cause, or a VU department bringing a notable speaker to campus, the Sarratt Box Office has you covered. We’ve streamlined the ticketing process to make it faster and easier than ever. Let us help you with your next event! Want to know more? Check out all the details in our Ticketing 101 Guide.